Pineta apartment is the first part used as Home holidays in House in the woods. It is furnished with an open kitchen, a sitting room with a sofa and upstairs there are 2 bedrooms, (a double one and one with 2 single bed), 1 bath with shower. Outside there is a gazebo and parking. In the heart of nature. The holiday home Casetta nel bosco is a semi-detached house composed by two units, called La Pineta and Il Bellavista, about 65 mq each one. 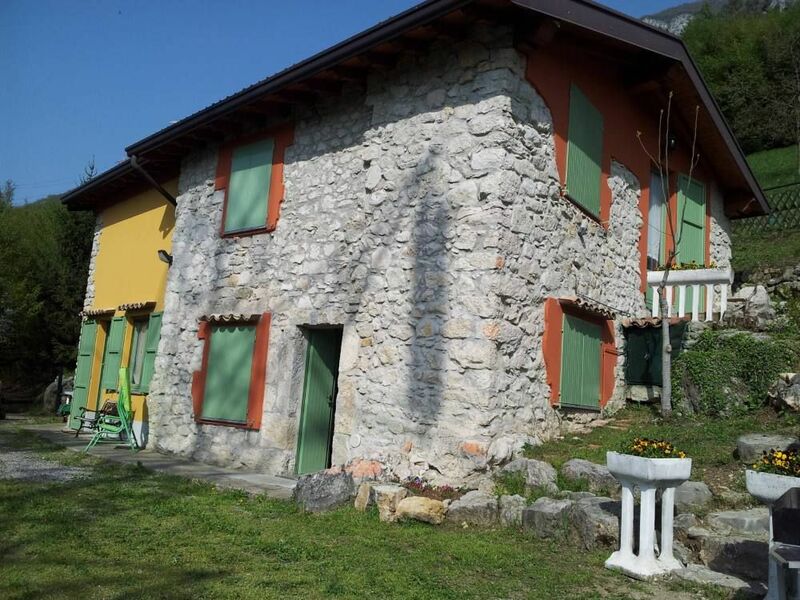 The holiday home Casetta nel bosco is located in Casazza, in the middle of Val Cavallina, between Orobie Alps of the Bergamo district, in Lombardia, the lakes region. Every apartment can host 4/5 people ( Bellavista appartaments can Host max 7 people) comfortably, it has a living room, an open kitchen, two bedrooms (one with double bed, and one with two single beds, in addition there is a sofa bed in living room) and one bathroom with shower. Every apartment has an internal stairway which links two floors. Outside there is a grill area with shades and sun chairs. The house is immersed in nature: 5000 mq of green woods, perfect for walks. The location is very quiet and it’s suitable for those who are looking for relaxation, privacy and who likes to stay in harmony with nature. In the neighbourhood: San Fermo Hills and Endine-Gaiano lake. We Are a young couple with two nice lovely children that decided to begin a new adventure and so to open the door of our Casetta nel Bosco to everyone, in this way we let you know place that we love. A place that, allowing us to get away from our daily routine, has always given to us relaxing days. We started this experience hoping that this activity will let us meet new people and so new cultures and traditions. We are waiting for you! Attention à la largeur du véhicule car passages très étroits dans le village. Grazie mille per la vostra presenza nella mia casetta e grazie per la recensione! Spero di rivedervi. A presto e grazie ancora anche per i cioccolatini! Wir hatten eine wunderbare Woche Urlaub in diesem schönen, gemütlichen Haus bei Casazza. Das Haus liegt etwas abseits und oberhalb des Dorfes Casazza im Wald. Es ist sehr gut eingerichtet und ausgestattet und bietet genug Platz für 4 bis 5 Personen. Wir waren zu fünft dort - 2 Erwachsene, 3 Kinder, 1 Hund. Melissa und John waren sehr freundliche Vermieter. Es ist nicht weit zum Badesee, zu vielen tollen Wanderrouten, nach Bergamo und vielem mehr. Wir würden sofort nochmal buchen! Thanks so much Ingo! I'm very happy to read that you are keeping a good memory of my house. Your words will be very useful to my future guests. We hebben 2 heerlijke weken in Casazza gehad. Genoten van de omgeving. Het meer van Endine ligt om de hoek. Het meer van Iseo is 30 minuten rijden. Er is genoeg te doen in de omgeving: bezoek Bergamo of Brescia, Monte Isola, Val de Vertova, zwemmen. Het huisje is simpel maar prima. Voor het huis staat een grote hoogspanningsmast, het is even wennen, maar na 2 dagen vergeet je dat het ding er staat. Dat geldt ook voor het geluid vanuit het dal. Het is niet stil, maar het plekje van het huis heeft wel iets vredigs. Gastvrouw Melissa is geweldig. Zelden zo'n behulpzame gastvrouw gezien: kregen schone handdoeken als we wilde en schoon beddengoed. Super! Die Unterkunft war für unsere Bedürfnisse optimal. Melissa war sehr freundlich und hilfsbereit. Der Kontakt war unkompliziert jederzeit möglich. Da bei uns fast immer die Sonne schien, haben wir das Aussengelände genossen: Frühstück auf der einen Terasse, Abendessen bei Sonnenuntergang vor der Tür, sitzen in der Sonne oder bei zu viel Hitze unter den Bäumen-einfach idyllisch. Die Gegend bietet viel Abwechslung. Wandern, Rad fahren, schwimmen, Städte angucken-alles gut möglich. Ein Stern weniger, weil die Zufahrt für unseren VW Bus sehr eng war und uns etwas gestreßt hat. thanks a lot for your words! It will be very useful for my future guests. I hope you have had a good coming back in Germany. Maison très propre et agréable. L'accueil de Melissa est très chaleureux, elle est soucieuse de votre installation dans son gîte. La région est magnifique. De belles randonnées à partir du gîte. Bergame est une belle ville à proximité et puis plein d'autres merveilleuses choses à découvrir, les lacs.... une semaine c'est un peu court. Très bon séjour dans cette belle région où il y a tellement de merveilleuses choses à découvrir. Melissa est une personne qui vous accueille très chaleureusement. Le gîte est très propre et au calme. Des départs de randonnées à proximité, Bergame est une très belle ville. Bref, une semaine c'est trop court pour tout voir. Thanky you very much for your words. It will be useful for my next guests. I have been happy to host your in my house and to know people like you. After passing Trescore Balneario, driving for 10 km you reach Casazza. Get off at Gorlago station. In this case we can organize a transfer. In this case too, we can organize a transfer. Even though it's located in an isolated area, several kinds of shops, a supermarket, a chemist and a park are all nearby the Casetta nel bosco. At about 3 km from the house you can reach Endine Lake, one of the few suitable for swimming lakes and where motor boats are forbidden. A long pedestrian walk away, which goes around the lake, is surrounded by the nature. You can reach San Fermo Hills in few kilometers and in about 30 minutes you can go to Sarnico, which is on the Iseo Lake, or to Bergamo city, with its wonderful medieval bastion aka Città Alta (transl. : High Town). In 40 Kms you arrive at Minitalia/Leolandia, while in 1 hour and half you reach Como Lake, Garda Lake (with its amusement parks like Gardaland) and Idro Lake in Brescia district. If you love mountain and of winter sports you take just an hour to reach Mount Pora or an hour and half to reach Ponte di Legno/Tonale Pass or Aprica Pass.